Starsky & Hutch, produced by Aaron Spelling and Leonard Goldberg and starring Paul Michael Glaser and David Soul, is the epitome of the hip, 70s buddy cop show. Season Three reacted to criticism about the hit series' boundary-pushing violence by pumping up the serious drama. 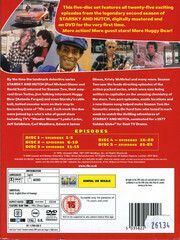 The 1977-1978 season tackled socially relevant themes while delivering tyre-squealing car chases, gunplay and colourful recurring characters live jive-talking Huggy Bear (Antonio Fargas) and quick-tempered Captain Dobey (Bernie Hamilton). A dazzling array of guest stars including Danny DeVito, Melanie Griffith, Suzanne Somers, Joan Collins and Philip Michael Thomas (TV's "Miami Vice") shared screen time with the two handsome cops, who directed some Season Three episodes. 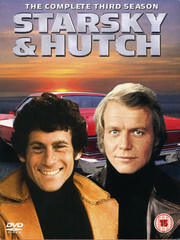 The show's outrageous style and tongue-in-cheek humour, now played alongside more serious storylines, made Starsky & Hutch one of the most popular and innovative cop shows ever.